I was interested to see that my Grandfather, George Oswald Frankland is listed on your website. Indeed he was the son of Frank Cowell Frankland and Annie Walton of Mickley. He moved down to North Lincolnshire for work and settled in Epworth where he met and married my Grandmother Phyllis Coultard in 1928. They had 5 children. Arnold, Frank, Mary, Betty and Phyllis. My Mother was Betty, but sadly only Phyllis now survives. He continued to work as a farm labourer until he was injured in an accident. He died in 1962, mainly as a result of his injuries and is buried in St Andrew’s Churchyard, Epworth. I attach a picture of them on their wedding day. see photo below. Alf Barlow is trying to trace his Great Great Grandfather. His name was John William Frankland. born 1858 in Grewelthorpe. His parents were Richard Frankland. and Eleanor Wood. Alf thinks John left home when his Father married again to Maria Jackson. John went to Manchester about 1877 where he opened a butcher’s shop. Olwen Bird [nee Frankland] asks. Can anyone tell me where the Franklands originally came from before Grewelthorpe please? It sounds German and I am doing my Family Tree. If you can answer this request please contact the site. Not sure if Olwen Bird’s request for information on the Frankland name has been fulfilled as I have only just come across the site. Wharfedale & Craven Genealogical Study also have lots of Frankland information. The following is an excerpt from the document Stuart sent to Olwen. Sir Henry Frankland, Knight, was the next owner of Thirkleby. He was succeeded by his son, Sir William Frankland, who represented Thirsk in three parliaments, and was created a baronet In the beginning of the 17th century one moiety of the parish came into the possession of the Franklands, in which family it still remains. The other moiety is the property and manor of the Viscount Downe. Thirkleby Hall is an elegant modern mansion, erected by Sir Thomas Frankland, Bart., in the Italian style, from the designs of Mr. James Wyatt, architect. It is situated on a gentle eminence on the north-west side of the village, in the midst of a spacious and well-wooded park. The old hall, which was a quaint Jacobean mansion, was demolished on the erection of the present one, but the beautiful avenue of Scotch firs which formed its approach, is still a picturesque feature. In the immediate vicinity of the hall are some fine specimens of the carnivorous tree, the cedar of Lebanon, Wellingtonia Gigantia, and purple beeches. A short distance from the east front is a small artificial lake, covering about three acres, and in a wood about 1’ miles distant is a wild duck decoy, both formed about five years ago. The house commands some lovely views of the beautiful scenery around. Towards the east lie the Hambleton Hills and the gigantic form of the White Horse, shaped out of the hill side, can be distinctly seen. On the south the view takes in the churches of Topcliffe and Baldersby, and from the roof of the house York’s grey tower can be seen rising above the horizon. The hall is now the property and residence of Lady Payne-Frankland, who, after the death of her husband, Sir William Payne-Gallwey, assumed the name of Frankland in lieu of Gallwey. The Frankland family were possessed of lands in Ickeringill in the parish of Skipton, soon after the Conquest. The name first appears in connection with Thirkleby in the early part of the 17th century, when William Frankland, Esq., who twice represented Thirsk in parliament, was seated here. Sir Henry Frankland, Knight, was the next owner of Thirkleby. He was succeeded by his son, Sir William Frankland, who represented Thirsk in three parliaments, and was created a baronet In the beginning of the 17th century one moiety of the parish came into the possession of the Franklands, in which family it still remains. The other moiety is the property and manor of the Viscount Downe. If anyone would like to read the full document please contact the site. Message from Shirley Leeks. May 2015: my Grandad was John William Frankland brother of Betty, Doris frankland. Etc When Richard Frankland married Maria John William my grandfather left for Manchester married Alice and my father only child Kenneth was the only son his brother John died 18 months old Robert Frankland son Robert and my father were cousins as with Henry hall are cousins of my father. Message sent from Dr. Richard Chapman of New Zealand. October 2015. Hackfall and the local families he grew up with. [Please note Harry died in 2018]. Most of the following information has been taken from census records and newpaper reports. ANNE FRANKLAND. Born 1823. Kirkby Malzeard. Dau of William John & Margaret Chapman. Married William Hainsworth. of Pudsey. Died 1906. ANN FRANKLAND. Dau of Francis of Kirkby Malzeard. Married on 21.4.1838 to Robert Brown. of Sawley. Son of Richard. Ann was a straw bonnet maker. ALFRED FRANKLAND. Born C 1872 Grewelthorpe. A servant in Manchester in 1891. BESSIE W. FRANKLAND. Born 1915 Dau of Henry Hall Frankland and Nellie Mitchell. Married Charles E. Jackson. CHARLES FRANKLAND. Born C. 1868 Grewelthorpe. A butcher living in Newton Lancs. in 1891. DORIS FRANKLAND. Dau of Robert & Eleanor Thackrey. EDWIN FRANKLAND. Born C1852 Grewelthorpe. Husband of Kezia of Tonge, Lancashire. Butcher in Newton Lancs. in 1891. EDWIN G. FRANKLAND. Born C.1890 Manchester. Son of Edwin & Kezia. ELEANOR FRANKLAND [nee Thackray] Born 2.12.1890. Grewelthorpe. Died March 1937 Grewelthorpe. Dau of William Thackray. Wife of Robert Frankland of Hill Top House, Grewelthorpe. see obit at end. See also Thackray page. ELIZABETH [BETTY] FRANKLAND. Dau of Robert & Eleanor Thackrey. FRANK COWELL FRANKLAND. Born C1866 Catterick Bridge. Married Annie of Mickley. In 1911 he was a cowman in Kirkby Malzeard. FRANK FRANKLAND. Born C 1867 Grewelthorpe. Coal miner in Kippax in 1891. FRED FRANKLAND. Bap 1.5.1864 Kirkby Malzeard. Son of Richard [Cattle dealer] & Eleanor of Grewelthorpe. GEORGE FRANKLAND. Son of John a wheelwright in Kirkby Malzeard. George was a wheelwright also. He married Isabella Raw. of Kirkby Malzeard, Dau of James Raw, on 23.11.1840 at Kirkby Malzeard. GEORGE WILLIAM FRANKLAND. Son of Charles [Cattle dealer] of Kirkby Malzeard. Married on 27.2.1879 at Kirkby Malzeard church to Lavinia Mavis Pidd. dau of George Pidd. Innkeeper. GEORGE W. FRANKLAND. Born C1872 Healey Masham. Son of John & Jane. He was a coalminer in Sunderland in 1911. married to Dorothy C1895. They had 3 children. GEORGE OSWALD FRANKLAND. Born C.1897 Kirkby Malzeard. Died 1962 in Epworth. Son of Frank Cowell Frankland[b Catterick Bridge] & Annie Walton of Mickley. He married Phyllis Coultard in 1928. See letter above from Dr. Antony Osborne. 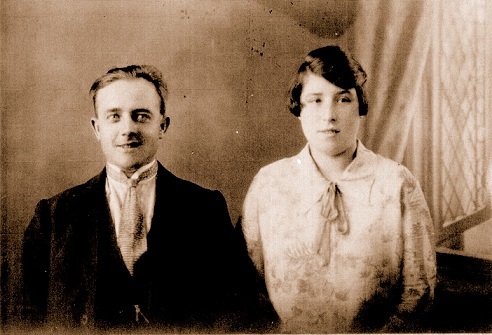 George Oswald Frankland and Phyllis Coultard in 1928. GEORGE FRANKLAND. Born 3 July 1912. A furnace bricklayer living Ripon in 1939. HANNAH FRANKLAND. Born C1865 Healey. Dau of John & Jane. HARRY RICHARD FRANKLAND. Born 27 November 1913. Grewelthorpe. Son of Henry Hall Frankland & Nellie. Died 6 February 2018 aged 104. Husband of Mollie and Hilda. See letter from Dr. Richard Chapman above. HENRY HALL FRANKLAND. Born Aug 15 1880 Grewelthorpe. Son of Richard & Maria Coldbeck. Lived Hackfall Mount Grewelthorpe. Married Nellie Mitchell. in 1907. Died 15 Dec 1966. He was a butcher. JAMES FRANKLAND. Bap. 6.10.1844 Kirkby Malzeard. Son of George [The Carpenter] & Isabella. JAMES FRANKLAND. Bap. 6.8.1859 Kirkby Malzeard. Son of Richard [Farmer & Jobber] & Eleanor of Grewelthorpe. JANE FRANKLAND [NEE Butterfield]. Born C1835. Dau of Jonas. Married John [stonemason] in 1854 in Bradford. JANE FRANKLAND. Born C1869 Healey. Dau of John & Jane Butterfield. JOAN FRANKLAND. Born Sept. 19 1916. Died 6 August 2011. Hamilton New Zealand. Youngest dau. of Henry Hall Frankland. of Hackfall Mount Grewelthorpe. 1928. Won a county minor scholarship to Ripon High School. Joan was a pupil at Grewelthorpe school. Married Leading aircraftsman George Bernard Chapman. son of E. Chapman. of Grewelthorpe. in April 1940. JOHN FRANKLAND. Born C1828. Son of George. Married Jane Butterfield. on 16.7.1854 in Bradford. JOHN WILLIAM FRANKLAND. Bap. 25.12.1857 Kirkby Malzeard. Son of Richard [The Farmer & Jobber]& Eleanor of Grewelthorpe. MARGARET FRANKLAND. Dau of Robert & Eleanor Thackrey. MARGRET FRANKLAND. Born C1861 Healey. Dau of John & Jane Butterfield. MARIA FRANKLAND. Born C. 1826 Kirkby Malzeard dau of Frank. Married on 6.1.1855 at Kirkby Malzeard church to William Lofthouse. [b.1830] son of John Lofthouse. the mason. MARIA FRANKLAND [NEE ?]. Born C1843 Grewelthorpe. Married in C1888 to Richard. Lived Hill Top House, Grewelthorpe in 1911. MARIA FRANKLAND. Born C. 1843 dau of William the coachman. Married on 9.6.1866 at Kirkby Malzeard church to Richard Ellis. Butcher at Kirkby Malzeard. son of John Ellis. Butcher. MARY FRANKLAND. Dau of Robert & Eleanor Thackrey. MARY FRANKLAND. Born C1859 Healey. Dau of John & Jane Butterfield. NELLIE FRANKLAND. Born 1910 Grewelthorpe. Dau of Henry Hall Frankland & Nellie Mitchell. NELLIE FRANKLAND [NEE ?]. Wife of Harry of Hackfall Mount, Grewelthorpe. Died Jan 1931. RICHARD FRANKLAND. Born C. 1829 Kirkby Malzeard. Died 1875. Son of William the Jobber. Married on 17.5.1856 at Kirkby Malzeard church to Eleanor Wood. [b.1837] dau of William Wood. Innkeeper. Richard was a Jobber when he married. Cattle dealer in 1864. RICHARD FRANKLAND. Born C.1829 Kirkby Malzeard. Innkeeper at Crown Inn Grewelthorpe. in 1891. Son of William John & Margaret Chapman. Husband of Maria Coldbeck. from Grewelthorpe. They married in C.1879 had 3 children. In 1911 living Hill Top House, Grewelthorpe. RICHARD FRANKLAND. Born C.1864. Unmarried servant at West Lees in 1881. RICHARD WILLIAM FRANKLAND. Born Aug 28 1921. Only son of Robert of Hill Top Farm, Grewelthorpe. Married Evelyn Ashby. in 1954. Dairy & Poultry farmer. ROBERT FRANKLAND. Born C1811 Kirkby Malzeard. Married to Ellen b. 1821 K.Malzeard. Robert was a Tailor, Draper and Methodist Preacher. [1881 Census]. ROBERT FRANKLAND. Born 1843. Buried 16.8.1843 Kirkby Malzeard. ROBERT FRANKLAND. Born Feb. 14 1879 Grewelthorpe. Son of Richard & Maria. In 1939 he was a disabled ex serviceman. ROBERT C. FRANKLAND. Born 26 Dec. 1909. In West Riding Constabulary Ripon in 1939. Unmarried. STEPHEN FRANKLAND. Born ?. Lived Aldfield. Built the organ in Aldfield Church. See photo of organ at end. THOMAS FRANKLAND. Born C 1837, Buired 12.1.1840 Kirkby Malzeard. TOM FRANKLAND. Born 9 Oct 1862 Grewelthorpe. Son of Richard & Eleanor. Servant with John Spence Timber merchant in Ripon in 1881. Married Mary A.A.Kershaw. in 1888 and lived Manchester. A widower in 1939 a smallholder living Galphay. WILLIAM PARSON FRANKLAND. Born C. 1745. Buried Kirkby Malzeard 2.3.1820. Married Margaret Spence. WILLIAM JOHN FRANKLAND. Born 1771. Married Margaret Chapman. b.1786]. WILLIAM FRANKLAND. Bap. 8.6.1845 Kirkby Malzeard. Son of William & Mary. WILLIAM FRANKLAND. Born C. 1879 Manchester. Nephew of Edwin & Kezia. WILLIE FRANKLAND. Born C. 1883 Grewelthorpe. Son of Richard & Maria. WILLIAM FRANKLAND. Son of Robert & Eleanor Thackrey. As reported in Ripon Gazette 18.3.1937 & 25.3.1937. The funeral of Mrs Eleanor Frankland wife of Robert Frankland of Hill Top Farm, Grewelthorpe took place on Wednesday at St. James’s Church. The vicar the Rev. I.Boon took the service. Mr J.F.Reid played the organ. Mrs Frankland was of bright and cheery disposition and very energetic and was held in high esteem in the village of which was a native. Miss Mary Frankland, Miss Doris Frankland, Miss Margaret Frankland and Miss Betty Frankland [daughters]. Mr T. Thackrey [brother from Manchester]. Mr H.H.Frankland [brother in law]. Mr T.Frankland [brother in law – Galphay]. Mr T. Thackrey [Uncle from Masham]. Mr J.Thackrey [Uncle from Wath]. Miss N. Thackrey [cousin from Harrogate]. Mr T. Mawer [cousin from Wath]. Mr & Mrs A. Frankland [cousins from Dallowgill]. Mr & Mrs Jackson [niece from Leeds]. Mrs R. Smith [niece from North Leys]. Stephen Frankland’s organ in Aldfield Church.